From Aviation News Scout, Virg Hemphill and originally printed in the Riverside CA Press-Enterprise Newspaper. Please make sure to read the remarks and correction just posted below this story by FASF Advisor and former First Aero Commander, U-2 and SR-71 pilot, Major General Pat Halloran, USAF Retired. Your Webmaster’s own cross-checking on the Internet unfortunately was not sufficient to reveal this story’s bogus nature. Any other knowledgeable readers are invited to add their comments, too. We always invite critical remarks on our stories simply because our single intent is to print only accurate and truthful posts. Men like this retired U-2 Dragon Lady pilot rarely get attention from the media, and that’s how they often prefer it. Either way, unfortunately and understandably, not all U-2 pilots survived their dangerous high altitude careers to tell their stories in their old age, but this high flying pilot’s recollections may be one of those more fortunate exceptions. He didn’t hang out on shadowy street corners with his trench coat collar obscuring his face. The Air Force major, now retired, spent his snooping time in a plane. 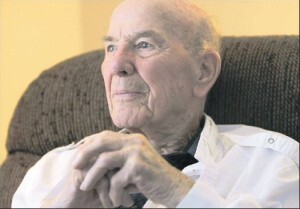 Beeler, 92, of Riverside, was a U-2 pilot at the height of the Cold War. His missions took him over Russia, Cuba and China, photographing targets from nearly 80,000 feet in the sky. His planes crashed more than once. He was occasionally targeted by MIG fighters, and he once landed on and took off from an aircraft carrier in the Pacific using only a few feet of the deck. Beeler, who grew up in Santa Ana, CA and spent most of his retirement in Santa Barbara, is a resident of Air Force Village West, near March Air Reserve Base. Back surgery in 2012 has left him reliant on a walker (photo below), but his memories are as vibrant as ever. 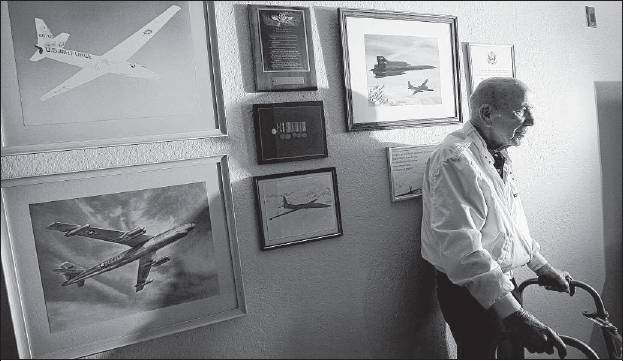 Cliff Beeler picture in his home among his numerous mementos of his unusual USAF career. He remembers enlisting at 19, during WWII, learning to fly a P-51 fighter, and being on his way to Saipan to get ready for the invasion of Japan. Then the United States dropped its atomic bombs on Hiroshima and Nagasaki . . . The war was over, and Beeler was sent home. Unlike many of his fellow pilots who left the service, Beeler stayed in. He learned to fly the Air Force’s first jets and then trained others to fly them. Then the U-2 program caught his eye. “I wanted to fly the latest,” he said. “There were never more than 24 pilots in the program,” he said. In 1958, he entered that highly specialized program. He spent seven years flying missions high above the Earth — out of the range of other planes – and most other defenses – in his long-winged and comparatively lightweight aircraft. As a plane climbs in altitude and the air thins, it must go faster to avoid a stall. The higher it climbs, the faster it needs to fly. Above 70,000 feet, the critical stall speed approaches the plane’s Mach speed, or the speed of sound — somewhere above 650 mph at that altitude. If that barrier is crossed, the shock waves can break the plane apart. U-2 pilots usually had a window of less than 12 mph between the two speeds! They had to meticulously keep the plane within that narrow speed window for hours at a time. Beeler learned the hard way what it meant to violate that window. He was above Louisiana on a night flight when he reached Mach speed. Fortunately, he was in the always used U-2 space (pressurized) suit with oxygen and had a parachute. After a long free fall, he opened his chute and found himself floating toward the ground. To his right, he could see lights on the ground. To his left, the same. But beneath him, all was black. Telling the story, Beeler reached down toward his calf, “I always kept a double-bladed knife in my suit leg pocket,” he said. He was able to cut himself free of the parachute and use the ties to temporarily lash himself to the tree. He took off his helmet and dropped it into the darkness below. There was a distant splash. “All I could think about was alligators and cottonmouths in the swamp,” he said. Lucky for Beeler, the breakup of his plane had been spotted on radar. Within an hour and a half a rescue helicopter was overhead. Another close call came over Cuba . 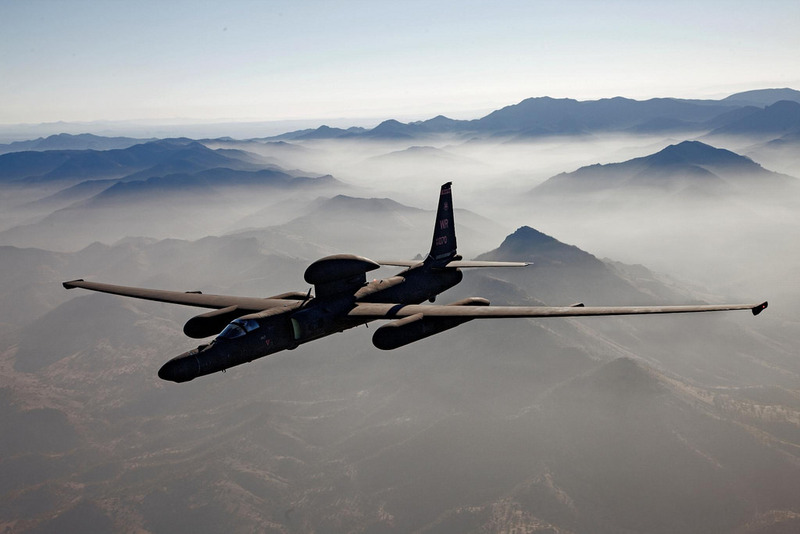 . .
Beeler said MIG jets would fly beneath the U-2 planes, at about 50,000 feet. The fighter pilots would sometimes attempt to reach the spy planes by turning on their afterburners and flying straight up, higher than the Mugs were capable of operating effectively. A Cuban pilot’s effort was particularly memorable, Beeler said. “I look back and there’s this MIG tumbling about 50 feet off my wing,” he said. The plane was so close that he could see the pilot’s face. Beeler took the U-2 on numerous missions over Cuba, providing information on the country’s armaments and the strength of its air force. Images from U-2 flights, he said, showed that Castro had only a few dozen bombers instead of the more than 400 he had claimed. At one point, Beeler said, President John F. Kennedy stopped by the then U-2 headquarters in Del Rio, Texas, to talk to the pilots. “He said, ‘You guys gave me information that prevented World War III at least twice,’ ” Beeler said. Sometimes the U-2’s high resolution, long-range camera captured images that had nothing to do with national security. During one Cuban mission, Beeler spent some time following the coastline. Afterward, he was called into the lab by the man in charge of analyzing the film. Returning from another mission, he took some images over San Diego. Later, he was shown a photo of a man sitting in his backyard reading the paper. “I could read the headline on the newspaper,” he said. 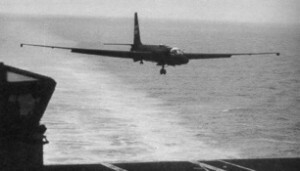 Beeler is somewhat famous among USAF U-2 pilots for his landings of his Dragon Lady on an aircraft carrier (below left). The landing followed a mission over northeast Russia . The U-2’s 80-foot wingspan meant it could only go a short distance before it collided with the superstructure of the ship. Because of the ship’s speed and a headwind, Beeler said he was able to touch down and come to a stop in only about five feet! “When I came aboard they had a ceremony welcoming the Air Force into the Navy. I said, ‘I don’t have much I like about the Navy except one thing,’ ” he said. That one thing was the Navy pilots’ leather jackets. Before he left the ship the following day, the Captain had given him one. 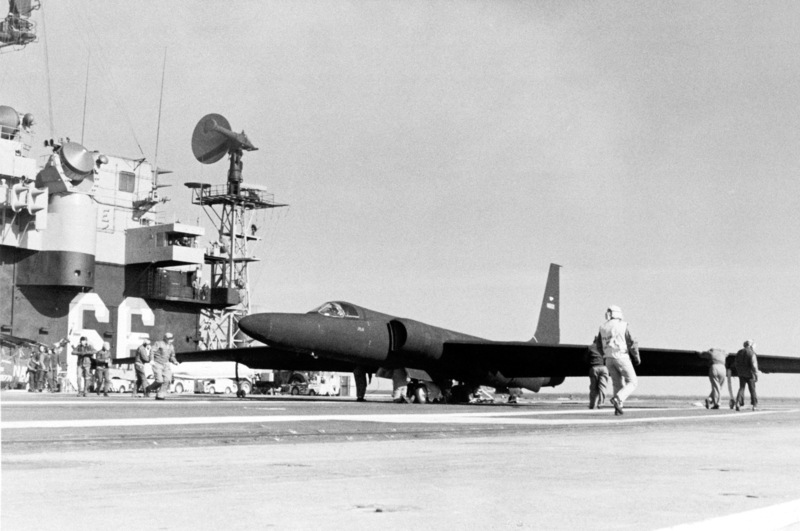 Above is a view of a U-2 reconnaissance aircraft parked on the flight deck of the aircraft carrier USS AMERICA (CV 66). “I gave it to my son last week,” he said. Among the military photos and plaques on the wall of Beeler’s room is a framed row of medals from his service, including the Distinguished Service Cross. He points to the photo of one plane, an experimental B-46 medium bomber. “It was a God-almighty bomber,” he said. But he declined a chance to fly it and similar bombers. After he left the service, in 1965, Beeler said he worked on the Apollo 5 program for three years. He was in charge of purchasing the equipment for the swing arm on the launch tower, he said. He spent the next 25 years selling airplanes. He had his own dealership in the Santa Barbara area. When his wife, Mary, developed Alzheimer’s disease, he retired to take care of her. 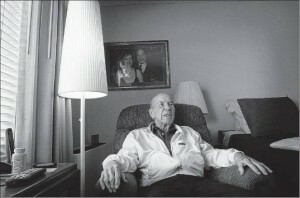 After five years, he felt he needed help, so he moved with her to Air Force Village West, which has a nursing home on its campus. The couple, who were married for 65 years, had two sons. The elder son lives in nearby Corona, CA, and comes to see him most days, Beeler said. For Veterans Day, he said, he doesn’t have any big plans. “I’ll probably sleep late,” he ventured. Above is a short (2:37) SILENT (NO SOUND) video showing the 1964 CIA conducted aircraft carrier test operations with the U-2 being conducted aboard the USS CV-61, the Ranger, a Forestall Supercarrier, the first to be built with a slant deck, enabling successful Dragon Lady operations. Wing Area: 1,000 sq. ft. This entry was posted in AVIATION NEWS on June 15, 2017 by FASFRIC. The Beeler stories are all, 100%, false. Some of the events never happened, and those that did were to some of our other pilots. The Riverside Press printed a retraction a week later after they got the real word. Cliff was a good U-2 pilot in his day but has obviously turned the corner. Pat Halloran, Maj Gen, USAF, (ret) U-2 pilot for 9 years, some of them with Beelers. Sorry to be part of “alternate fact” & fake news” as seems to be a part of our present day media….the U -2 story apparently is a good example of corrupted media…apologies offered! Heck, no apologies needed, Virg. I got stung myself. This is one reason it’s nice to have someone like General Halloran on board to help keep us in line! When I found the actual story printed in the local Newspaper in Riverside – – – and checked it against the email you received about it, it was “correct,” but clearly, it turned out to be just one more example of how inaccurate and “FAKE’ the media’s news is these days. I can remember when good reporters checked their facts before publishing. Not sure why I didn’t find the retraction the General said they made. Oh well . . . I met the then Major Pat Halloran at RAAF base Laverton in early 1965 when the U2 was used for upper atmosphere sampling for radiation from French bomb tests in the Pacific. I was very junior RAAF officer and Pat took me under his wing and took me to see a U2 pilot being readied for flight and watched the actual take off. Pat was delightful and generous and never mentioned his Cuba experience. I sometimes think of him. The U2 at our base was replaced by an even higher flying RB57F which was flown from RAAF East Sale. BTW, RAAF is Royal Australian Air Force. I wish this comment could reach Pat.